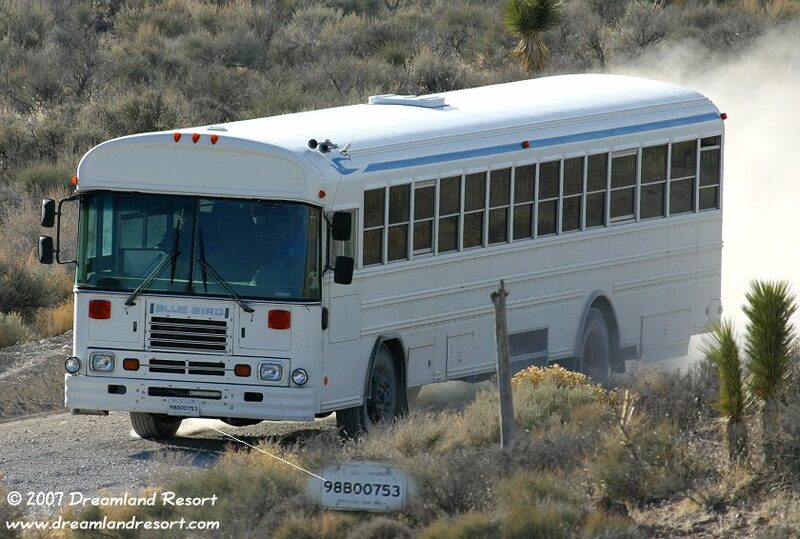 The famous White Bus brings workers from Alamo and other nearby towns into Area 51 each weekday morning. There are several unmarked stops along Hwy. 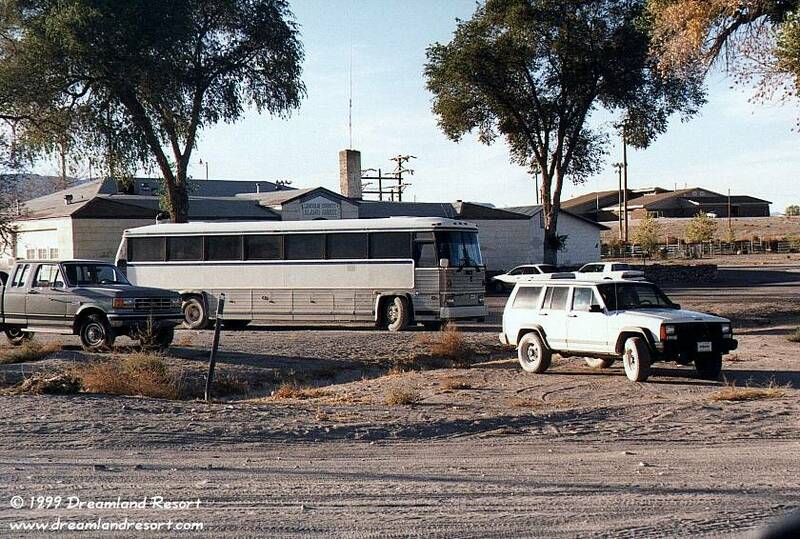 93 where the workers park their cars and get in the bus to go to work at Area 51. 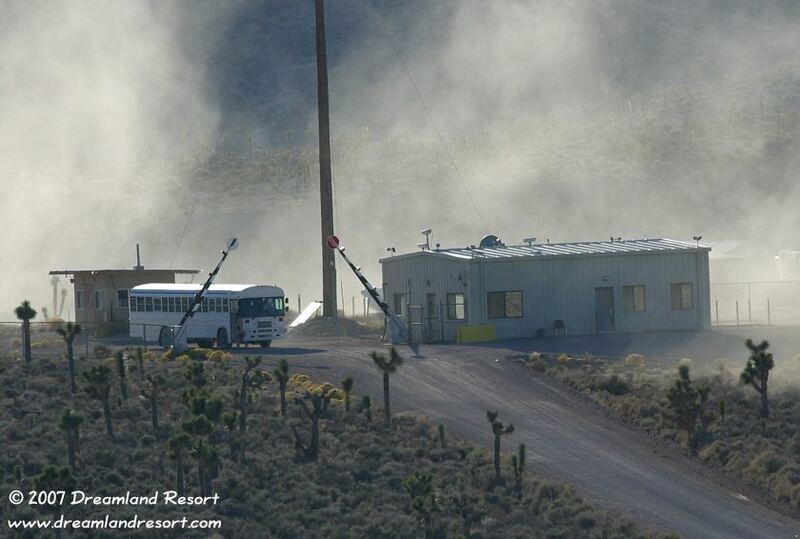 The bus enters the base by the signs on Groom Lake Road at about 7.30am, and leaves at 4.50pm. It takes about 10 minutes to get from the signs to the terminal inside the base, which means that the work hours for the workers are from 7.40am to 4.40pm. The bus has a US Government license plate "86B1371", which indicates that it has been in service since 1986. 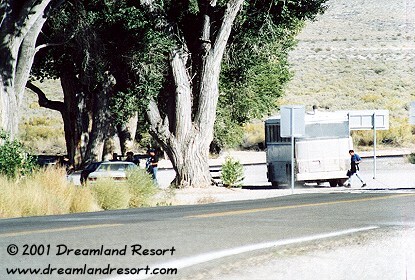 It is used at Area 51 since around 1997, when it replaced a much smaller bus. The windows are tinted as protection from the desert sun, but contrary to common belief not "blacked out". 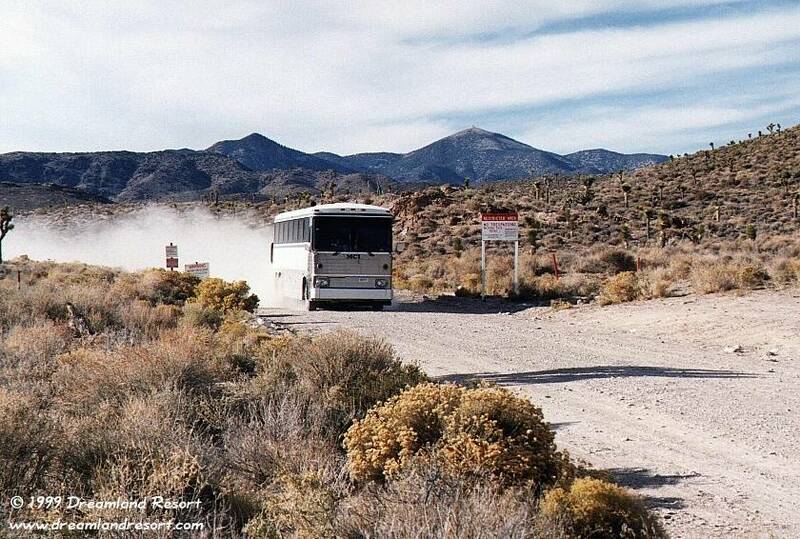 You can't miss the bus on Groom Lake Road; just look for the huge trail of dust that it leaves behind. 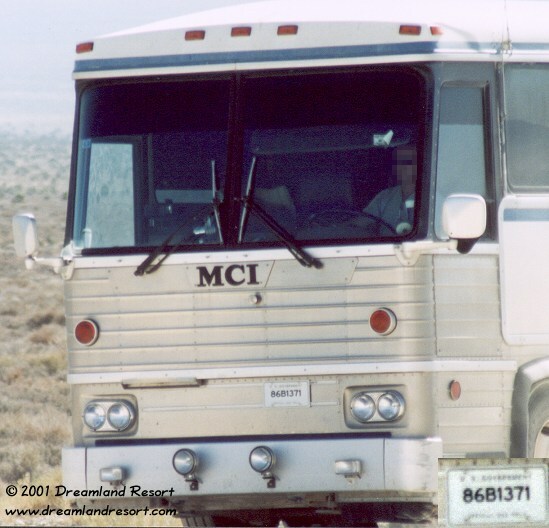 When you meet it on Groom Lake Road you better get out of its way in a hurry. The driver may brake for aliens, but certainly not for curious tourists. Here is the complete schedule of the bus, coming out of the base. The morning commute is the exact same in the opposite direction. The exact number of workers varies depending on the activities at the base. Usually there are about 10 to 20 workers at each stop, sometimes considerably less. 5:25pm: Stops just south of the "R"-Place station in Ash Springs. More workers get out, and into their own vehicles. The bus continues south. 5:30pm: Turns right in Alamo, right behind the Chevron gas station. Continues straight for three blocks, then turns left and parks in front of the Alamo Court House/Town Hall, where the rest of the workers get out. The bus stays there over night and on weekends. 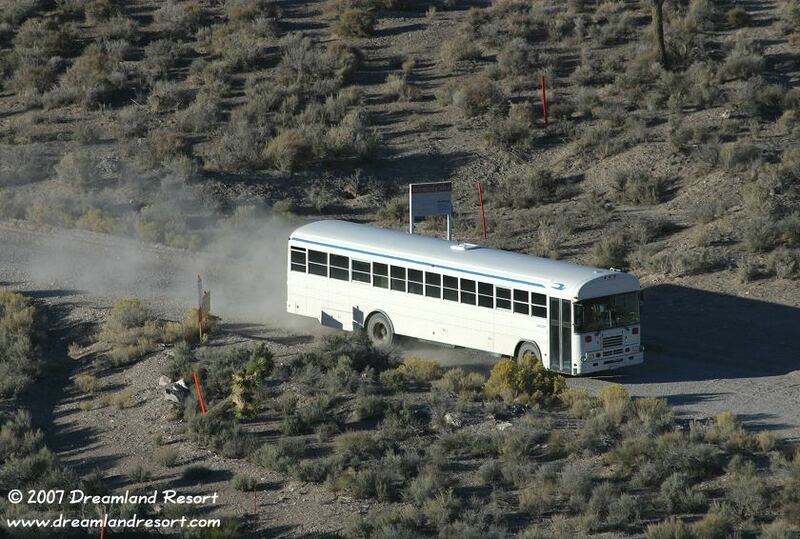 The white bus, just coming out of the restricted area on Groom Lake Road. When it approaches you better get out of the way in a hurry. The 35mph speed limit does not seem to apply for its driver. The new bus stop, at the Y-intersection of Hwy. 318 and 375. Funny that the workers exit the bus right at the foot of the ET Highway sign (seen from the back here). Their cars are parked in the shade, to the left of the bus. There are usually four vehicles parked here. Two drive towards Hiko on Hwy. 318, and two towards Caliente on US 93. Photos taken in September 2001. At night and on weekends the white bus is usually parked in front of the Alamo Court House, only three blocks from Hwy. 93. The white Jeep Cherokee in this picture is also usually parked there. 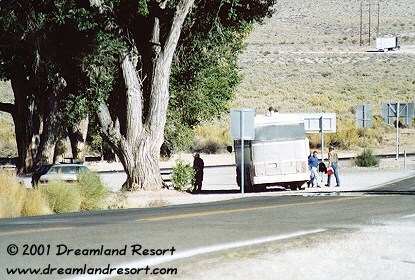 The bus at the intersection of Groom Lake Road and Hwy. 375 in September 2001. Notice the additional high beams and fog lights. The driver's face has been blurred to protect his privacy. The US Government license plate "86B1371" (zoomed in the lower right corner) indicates that it was originally put in service in 1986. It is in use at Groom since about 1997.